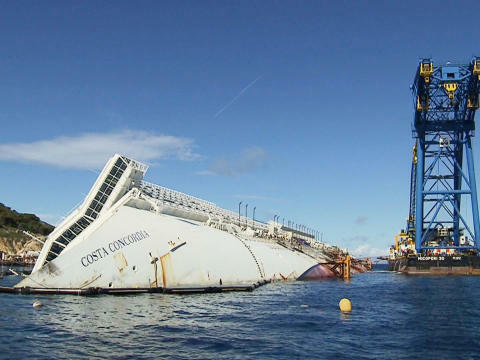 A new website has been launched by Costa Crociere and the salvage company given the contract to re-float and remove the Costa Concordia wreck which lies just off the coast of Giglio, Italy. The website details Parbuckling which is the technical term used for the process of rotating the shipwreck back into an upright position. This is probably the most complex phase of the ship’s removal. The site offers a literal step by step illustrated section that details exactly how the salvage team intends on doing this. The initial phase in the removal project is complete. This involved the stabilization of the wreck which was imperative to avoid the ship slipping and ultimately sinking completely. The next phase is to prepare the false bottom on which the ship will sit after she has been rotated. The rotation will happen in two phases. The first will involve grout bags being positioned and filled with cement in order to create a steady and stable base for the hull. Platforms will then be fixed in place and a crane will be used to install water-tight caissons to one side of the wreck. Once the above is complete the parbuckling phase will begin. The ship will be lifted on one side and more caissons installed on the opposite side, the ship will then be re-floated. The entire process has never been attempted before. It is in fact a first for engineering. Costa Crociere has stated that the Parbuckling Project website will be regularly updated to reflect on the various phases of the plan. The below video is also a good illustration on how the process actually works.